This is one of those albums where I cannot even remotely pretend to be objective – The Monkees was the first album I ever owned in my life, so it holds a very strong and emotional place in my heart. I’ve known every track from the original Colgems release, back to front, since I was about 4 years old. It immediately set the foundation within me – from “Saturday’s Child” to “Papa Gene’s Blues” to “Sweet Young Thing” to “This Just Doesn’t Seem To Be My Day” to “Take A Giant Step”. It is album filled with nothing but goodness – great, memorable, instantly sing-able songs – songs that last a lifetime with you. I’m not going to get into the sociological arguments on the validity of The Monkees as a recording entity or as “a real rock group”. I have loved The Monkees from childhood onward and this album is where it began for so many. I learned how to sing – how to sing harmony – and dabbled with writing lyrics by listening to this album as a child. I wanted to be Mike Nesmith; I wanted to play guitar and sing. The Monkees was the catapult that sent me into my first trajectory into what eventually became my musical life. It was The Monkees, before The Beatles, that showed me the way. Over the last nearly-30 years, Rhino has lovingly reissued The Monkees’ catalog that had been out of print for so long. When The Monkees was issued in 2006 as a two-CD deluxe package, it seemed like they made greater an album that was already quite stellar on its own. By adding many of the songs from the vaults (a track like “All The Kings Horses”, which I knew from the T.V. show but had never been officially released until the Missing Links series came along) and the “TV version” of the theme song, The Monkees’ debut was now a completed picture. This boxset expands a bit further except with one glaring omission – which is on the 2-CD edition – the Michael Nesmith vocal version of “I Don’t Think You Know Me”. Simply put, one of the best originally-unreleased Monkees tracks and THE definitive version (note: there are three versions – 2 with the same backing track, one sung by Micky Dolenz, the other by Mr. Nesmith and a completely different version with Peter Tork singing lead). And the Papa Nes version was the keeper, so why this was the one song not included is beyond me, when everything else from that 2-CD set is here. Aside from that, the stereo remixes are great; the mono mixes even better; the backing tracks are interesting because you can hear nuances that you may not have been able to pick up on previously. The third disc is the curiosity and a definite package-completer. Prior to signing on with “The Monkees”, Davy Jones had been signed to Colpix Records (the predecessor to the Colgems label) and released an album in 1965. For the first time in nearly 50 years, that album is now available in both stereo and mono as part of this box. The songs have Davy’s charm – some of his British-music hall type standards like “Any Old Iron” – and are a nice addition, especially since his passing in 2012. As well, six songs that Mike Nesmith cut also for Colpix are included – these were released under the pseudonym “Michael Blessing” and are a fascinating insight into the early folk leanings of a greatly innovative and forward thinking artist. Save for the one oversight by Rhino, once again, a Monkees boxset is worth the cost. It’s The Monkees. It’s a classic – for all time and for everyone. 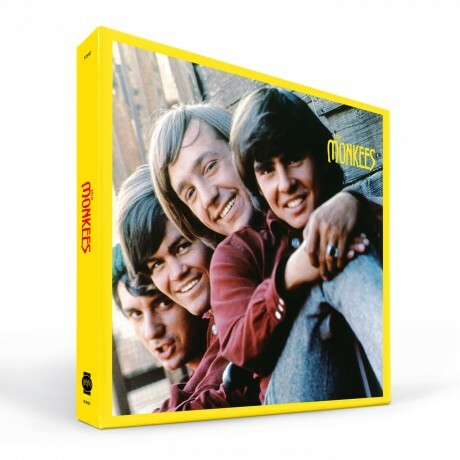 The Monkees (Super Deluxe Edition) is available now in a very limited quantity.